When Charles Raison hosted a fundraising dinner for Jestun Pema, the sister of His Holiness the Dalai Lama some years ago as a faculty member at the University of California at Los Angeles, little did he know his future would become intertwined with His Holiness. Raison, who is a psychiatrist and an associate professor in the Department of Psychiatry and Behavioral Sciences at Emory University School of Medicine, began his career at Emory in 1999. 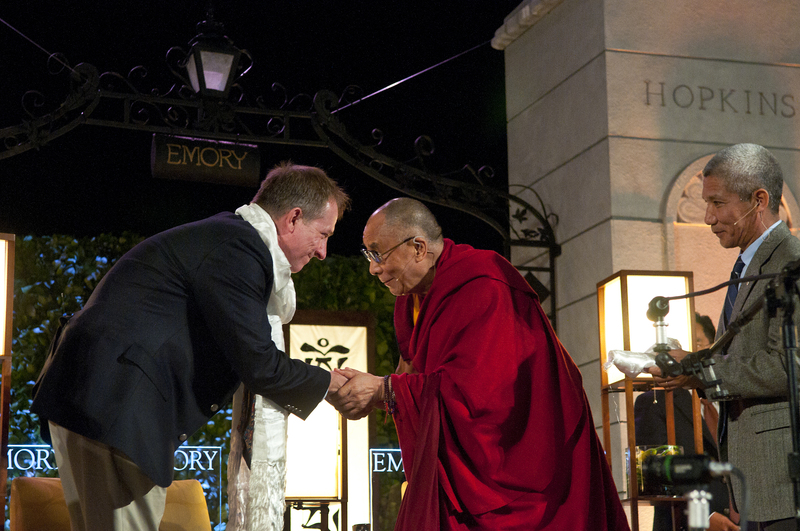 Since that time, he has emerged as one of the leaders in Emoryâ€™s remarkable relationship with the Dalai Lama through the Emory Tibet Science Initiative (ETSI) and his research on the potential health benefits of compassion meditation. 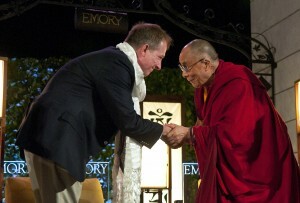 The Dalai Lama recently visited Emory in his role as Emory Presidential Distinguished Professor and presided over a series of conferences related to ETSI.Â Raison made a presentation to His Holiness during the Compassion Meditation Conference. Many are profoundly moved by the Dalai Lamaâ€™s presence. His spirited nature seems to infuse the atmosphere wherever he goes. However, in a CNN blog, Raison says that apprehension can run high when you come directly in contact with his remarkable intellect and quick wit. â€œIf he doesnâ€™t like or agree with what youâ€™re saying, heâ€™ll tell you so in no uncertain terms. There are stories of famous scientists thinking they were going to get a rave review, and instead the Dalai Lama devastated their pretensions with one simple question or observation. When Raison took his place on stage next to this inspirational figure to present his data, with thousands in the audience, he felt his hands shake as he began to speak. â€œI was as prepared as I could be for any type of reception as I began showing him our data on how compassion meditation appears to help reduce stress hormones in teenagers in foster care,â€ Raison wrote on CNNâ€™s health and medical blog, The Chart. As the session came to a close, the Dalai Lama commented that children with the opportunity to learn the concepts of compassion early in life will have the capacity to impact humankind as they grow into adulthood.